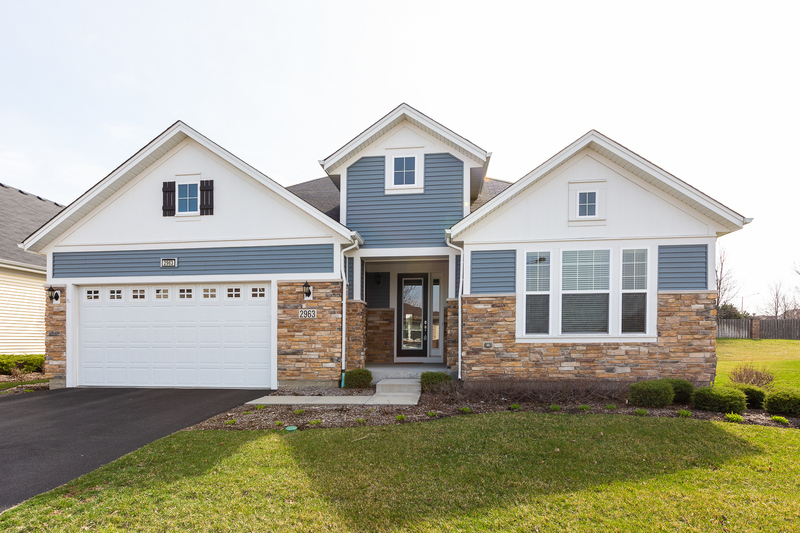 This Stately Smithsonian Ranch Home in THE CARILLON CLUB - Naperville&apos;s Premier Active Adult Community is the home you don&apos;t want to miss. Just one block from the clubhouse, indoor & outdoor pools, tennis courts and more! 2575+ Square Feet, 2 Bedrooms, 2 & 1/2 Bathrooms, Den, Formal Dinning Room, Gourmet Kitchen w/SS Appliances, Granite Counters, Ample 42" Cabinets, Breakfast Bar & Separate Eating Area. The Spacious and Bright Family Room with Gas Fireplace has additional seating space. Master Suite w/Soaking Tub, Separate Shower, Double Bowl Vanity & Two Large Walk-in Closets. Second Bedroom with in-suite Bathroom is ready for guests. 2 Car Garage w/Professional Epoxy Floor, Larger than average Lot, Hardwood Floors & Unfinished Basement w/Rough-in Bath Completes this Beautiful Home The Carillon Club is a gated 55+ Active Life Style Community. Club Amenities, Landscape & snow service included in the low HOA Assessment. Live the life you have worked for!